Fans of Hallmark’s Chesapeake Shores TV show can breathe easy. The cable channel has announced that Shores has been renewed for a third season. Season three will have 10 episodes and is expected to air Summer 2018. PASADENA, CA – January 13, 2018 – Hallmark Channel announces it has renewed the network’s hit, original series “Chesapeake Shores” for a third season. Airing on Sunday nights at 9 p.m. ET/PT, “Chesapeake Shores” was one of Hallmark Channel’s most-watched original series. Production on 10 episodes for season three is scheduled to commence this year for a season three premiere Summer 2018. The announcement was made today as part of Crown Media Family Networks’ TV Critics Association Winter Press Tour. Based on the novels of the same name by New York Times bestselling author Sherryl Woods, the series stars Jesse Metcalfe (“Dallas”), Meghan Ory (“Once Upon a Time”), Golden Globe® nominee Treat Williams (“Everwood,” Hair), Academy Award® nominee Diane Ladd (Wild at Heart), Barbara Niven (“Debbie Macomber’s Cedar Cove”), Laci J. Mailey (“Falling Skies”), Emilie Ullerup (“Sanctuary”), Brendan Penny (“Motive”) and Andrew Francis (“Final Destination 3”). Gregory Harrison (“One Tree Hill”), Victor Webster and Jerry Trimble guest starred in season two. The multi-generational family drama “Chesapeake Shores” follows Abby O’Brien (Ory), a high-powered career woman, divorcee and mother to twin daughters, as she adjusts to life back in her hometown of Chesapeake Shores. Abby now balances a budding relationship with her former high school sweetheart, Trace (Metcalfe), working for a firm that does business with her uncompromising father Mick (Williams) and raising two young daughters. Returning to her hometown means engaging in the lives of her siblings: Jess (Mailey) a free-spirit trying to succeed as a bed and breakfast owner; Bree (Ullerup), a playwright who buys a bookstore in Chesapeake Shores after moving back home from Chicago; Kevin (Penny), a soldier adjusting to civilian life and new romance; and Connor (Francis), a new lawyer establishing his professional career. 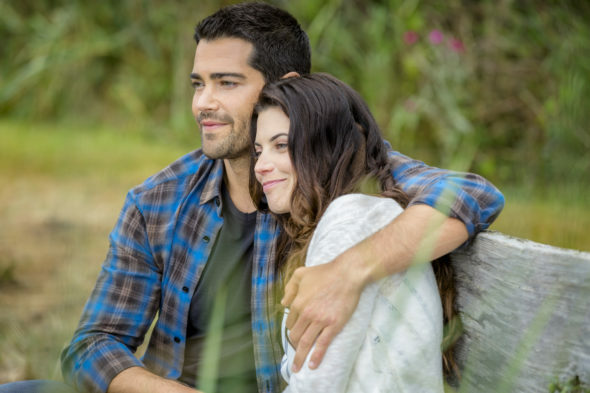 Having returned to Chesapeake Shores shortly after Abby, the O’Brien’s once-estranged mother Megan (Niven) strives to reestablish relationships with Abby and her siblings, though the O’Brien clan primarily looks to its wise grandmother Nell (Ladd) for guidance. What do you think? Do you like the Chesapeake Shores TV show? Are you glad that it’s been renewed for a third season or, do you think it should have been cancelled instead? I’m glad it was renewed I just hope that Abby and Jace stay together. I should have never left for Europe. I loved the first and second seasons of Chesapeake Shores. When I read that it was renewed for season three I checked frequently for updates about when I could watch. As I subscribe to Bell Satellite, I usually watch Hallmark programs on “W” network channel 1705. To my great disappointment, Chesapeake Shores was not broadcast as forecast. What happened?? Will season three be broadcast at another time or on a different channel? I do not have access to stream or demand services thru my Bell Sat. Any suggestions?? I love watching the Chesapeake Shores series. The actors and actresses are great. Unfortunately I think the writers are terrible and should be fired or replaced with more talented writers. The story-line this season was not to my liking to say the least. I think the stories should make a person feel good…these did NOT! I love Chesapeake Shores. Great show. My husband and I watch it together all the time.